Goistais does not have to mean Magician but perhaps Annointed. This could be the Holy Grail intact. Perhaps the saucer with the fish is somewhere near the site. Perhaps this could be translated with knowledge of spiritual things. DIA CHRSTOU O GOISTAIS The DayStar is Risen from the Dead. The Christ Child is Annointed. The Christ is Dead. The Christ is GOD. Who can say for certain what lies behind the curtain. This is supposed to be Greek it’s all Greek to me they say. DIA CHRSTOU O GOISTAIS how about this one The Christ’s Cup, after all its supposed to be the Chalice they passed around with wine each person sipping some. EN France DIA CHRSTOU LE GOISTAIS. A greeting Perhaps such as Hail Christ the Goistais. This could still be a chalice used as a worship cup passing around from hand to hand behind locked doors of Romans lands. AiAx Phctoy. Perhaps a sect of Christians drinking wine from vats stored underground the city they all got some and shared and cried and hoped that Jesus was soon coming back each person there a saucer with a fish and honeycomb and bread they broke a hunk and chewed it some and drank the cup while passed around the room to each person it went this little symbol of love. Today we have the plastic grape vessels to each partake together separately what is supposed to be a group is just a lot of individuals. When was the last time you saw free food at Church perhaps the fish is there at 5$ or $10 a plate. Dia can be an equestrian adjective a sort of greeting like Hail Mary. Perhaps the Christians all held hands formed in a Circle and spoke these words out loud like mono syllables to make it seem like some Edwardian Chant. AiAx Phctoy was the Sorority of the Jewish temple perhaps the Pharisees chanting and drinking wine in an effort to knoe Christ. They were Fair of Face and very healthy and wealthy people not one was sick or lame they lived in Richness of many splendored money. 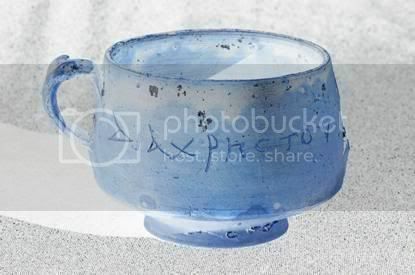 Perhaps the Sadducees had wealth enough to buy this cup and use it in the sanctuary as a rite to pass around the wine and try to understand what Jesus did. It looks to me to be exactly what it is it has a handle to be held while dipped in earthen jars of great proportions they held the wine in vats of oversize then dipped the cup up and passed it all around like beer off the wall. The wine vessels were all lead linned to prevent the atomic powered x-rays from leaking into the wine but what the Romans did not knoe and forgot was the lead was leeching INTO the wine and killing them a little at a time. There was a FISH sign hanging on the door then after entry there was an upper room. SO now we have an understanding of the meaning let’s see it in writing. AiAx Phctoy The Secret Society OF Jesuits. DIA CHRSTOU O GOISTAIS Hail Ave Jesus Christ OF Galilee. We found the door with the fish sign on it next to the alley of the Jewish deli. There was 15 men and women all homeless eating and drinking in the darkness calling it worshiping there King. Eye argued with the High Priestess and convinced them to let the Christians live. They are taking me to the village square tomorrow to cut me off. To live is Christ to Die is Gain. Bring the poem from the grave. For eye will read some of them in Heaven when I’m done. DIA CHRSTOU O GOISTAIS The Christ’s Cup. The Jesus Bowl.